Quart freezer bags are the perfect way to store small portions such as a cup of soup or just enough cheese to sprinkle over your favorite spaghetti recipe. This is because they are cheaper than freezer storage containers. They are also less bulky as they lay flat, meaning that you can store more food than the containers. If you are looking for quart size freezer bags, here are some of the top options to consider. Seal-A-Meal quart freezer bags are conveniently pre-cut in quart sizes. 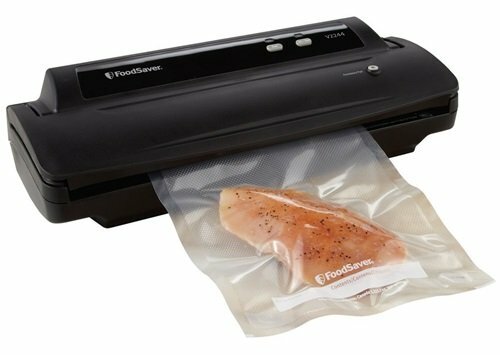 This helps you save time and eliminates wasted bag material when freezing items using a vacuum sealer. These bags have a multi-layer protection to ensure the food inside stays fresh. And they help lock in the food’s moisture and natural juices while removing air to protect food from freezer burn. Each bag also has a white write-on area where you can indicate what the contents are. This helps to eliminate unnecessary confusion when you are planning your meals. The bags are pretty versatile and besides the freezer, they can be used in the refrigerator, microwave or simply simmered in the pan. FoodSaver is currently the leading brand in all things vacuum sealing so it isn’t surprising that these quart freezer bags make the bestselling list. This system includes a new barrier that traps moisture and the natural juices in the food while removing that unwanted air. Air—and we're mostly talking oxygen here—is always the major culprit for freezer burn. They are a soup lover’s favorite as they are leak proof. Or you can use them to freeze stocks and broths that can form the base of delicious meals later on. These quart-sized bags are also pre-cut, so you don't have to mess with scissors and risk getting hurt. FoodSaver's expandable pleated heat-seal rolls are able to expand to fit large items. What’s in the box? Two 11-inch x 16-foot rolls. In essence, these rolls also allow you to customize the storage size you need. So, because each roll is 11-inches long, you can freeze an entire rotisserie chicken for dinner next month. And because the rolls are pleated, they can expand to accommodate extra large items. 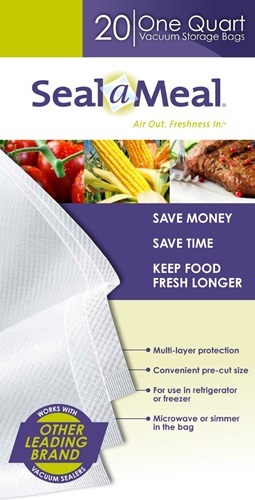 FoodSaver's patented “Multi-ply” material also protects whatever is stored inside from freezer burn and creates a clean seal so you don’t have to clean up afterwards. So if you don’t have one, you may want to check out this bestseller. They are the bestselling BPA-free freezer bag brand in America so this potentially harmful chemical won’t seep into your food. Plus, they are simmer and microwave safe. That also means less washing up afterwards. Place the steaks or chops inside and simply zip, lock and they are ready to freeze. This is because they close tight the first time so no need to slide the zip back and forth hoping to secure the bag on the tenth attempt! So just how good is this bag? Let’s put it this way; this particular freezer bag brand won the ChefsBest Award for its performance in food storage. So chances are that it will exceed your expectations. But its use is not confined to the freezer. It’s ideal for the refrigerator, pantry and storing toys or cosmetics for the weekend out of town trip. You’ll also be pleased to hear that it meets airport security guidelines for transporting liquids. So you have no excuse for forgetting your carry-on medicine in the tray by the airport security scanner. Basically, this value pack of 120 freezer bags gives you all of the benefits of the strong Hefty zipper bag in a low-priced multi-pack. So the price is anything but hefty! So because you pay less for more, these bags really are a steal! These quart commercial grade freezer bags are heavy-duty. Look a little closer and you'll notice that they have embossed channels for expelling air, locking in the natural juices, nutrients and even marinades on everything from your salmons to fillet steaks. So your food items will be protected from freezer burn and stay fresher for longer in the freezer if you store them in these bags. Plus, they are refrigerator, simmer and dishwasher safe. Don’t be fooled by the no-frills packaging because customers rave about these quart freezer bags.